The Scars of Velious had just come out and a hoarde of Syndicate members were combing the new lands unlocking its secrets and mappings their new surroundings. One interesting place that was discovered was the giant fort. 50feet tall, hard hitting and able to see invisible, the Giants posed a formidable threat considering most all were level 50+ and at that time in EQs history, lvl 60s (much less 65's) didnt exist and neither did AA points. Forming up outside Kael, a large Syndicate team (along with some friendly nonmembers) prepared to go inside. As they went inside, the way first appeared fairly easy facing monsters that con'd green to them. Deeper and deeper they pushed and soon the monsters began to con blue to them. Forming a defensive camp, deep within the Giant stronghold, Syndicate pullers like Tarzool the bard, would lead wave after wave of giants into a well laid trap. The giants also kept HUGE Direwolves as pets that came to their aid. Pakjol the Hungry was the lead dire wolf. The wolves and the giants were outgunned even when Captain Bvellos showed up to rally his giants. Try as they might they couldnt drive the Syndicate invaders from their base. Soon all was quiet and the place looked deserted. An errie calm settled over the team when suddenly they felt, more than heard, deep vibrations in the rock walls. The vibrations grew more intense and louder until Dlammaz Stormslayer, Champion of the Giant City stormed into the Syndicate camp. Standing fully a head taller than all other giants with many more HP, he was one of the more major mobs in Kael that have been killed at that time. There were no Tormax slayings back then. Vindi wasnt farmed every time he spawned. Big named mobs were hard and a challenge and fun. Wave after wave of attackers smashed into him. His might weapons cleaving men in two and laying low the most powerful of heros. Clerics were working overtime resurrecting the dead so they could fight again. Blood streaked the walls and still the giant stood. It was no wonder he was the champion of this great city. Weaving the bonds of magic to turn one of the massive Dire Wolf pets against their masters, the Syndicate troops and their friends once again attacked the giant champion. With the Direwolf taking the brunt of the attacks huge amounts of magical enegy were unleashed and steal bit into the giants flesh. Quad hitting for 500 points each the giant fought back trying to pound the attackers into oblivion a final time and secure his city. The battle raged for many minutes but eventually the giant weakened. Sensing the opening the attackers reknewed thier furious assault and soon the giant fell over with a horrendous *thud*. 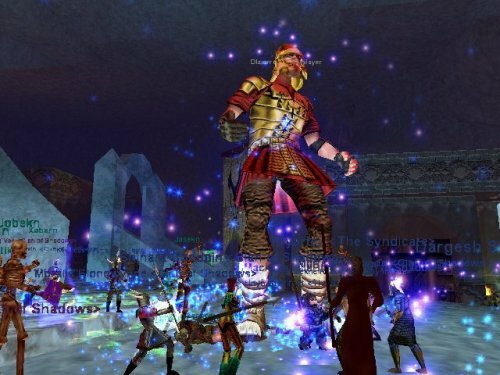 For the first time on Tarew Marr (and for the first reported time on any server), that giant had been killed. It had been overcome by the mighty forces of The Syndicate.